I love chicken salad, as I’ve mentioned before. It is a favorite quick and delicious lunch option in our house. We have made several variations on the classic, and this one is a particular favorite. No surprise there, since it’s inspired by Greek flavors. You make a tzatziki sauce to stir the chicken in, and add diced cucumbers, olives, red onion, and tomatoes. You can serve it in a pita if you’d like for a slightly more authentic meal, or just on a roll like we did. We had to skip the feta since we were out of it, but I do think it would be a really nice topping for serving! 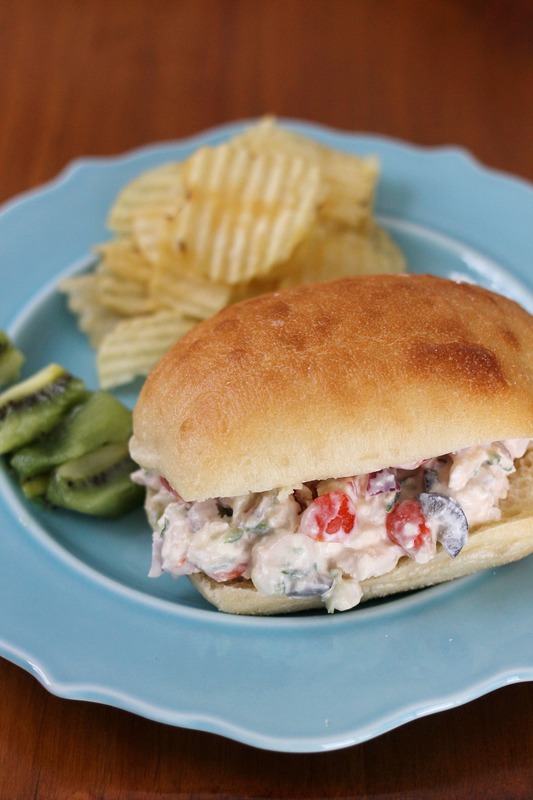 Regardless, this is a healthy and great-tasting chicken salad that we’ll be sure to make again. Stir together the chicken, cucumber, tomatoes, onion, olives and tzatziki sauce in a medium bowl. Season with salt and pepper. Refrigerate until serving Serve over pita bread or whatever bread you choose with a crumble of feta cheese. Enjoy!